Roma are reportedly set to convince Kostas Manolas to commit his future amid speculation linking Chelsea and Man Utd with a move for the Greek defender. The 27-year-old has established himself as a fundamental figure at the Stadio Olimpico since arriving from Olympiacos in 2014, as he has gone on to make 174 appearances for the club. As they continue to pursue Champions League qualification and major honours, he’ll remain a vital part of that push and it appears as though the Giallorossi are eager to tie him down to a new deal. Crucially, as per Calciomercato, that could remove the €36m release clause that exists in his current contract, leaving them at risk of a top club activating it and being given the chance to convince Manolas to leave. 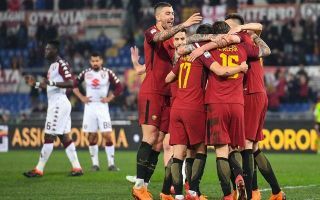 Both Chelsea and Man Utd are specifically named in the report as interested parties, with Maurizio Sarri and Jose Mourinho both linked with bolstering their defensive options this past summer, and so without a release clause, it could prove to be increasingly difficult to reach an agreement with Roma over a sale. Despite having countless defensive options at his disposal, Mourinho has seen his United side concede seven goals in their opening four Premier League games which is nowhere near good enough if they wish to find the consistency required to win the title this season. As for Chelsea, they’ve only conceded three goals in that same time, but with Sarri’s desire to implement his style of football which will see them continue to build out from the back, coupled with the likes of David Luiz and Gary Cahill entering the last year of their respective contracts and being on the wrong side of 30, it could call for reinforcements in the near future. However, should Manolas sign a new deal with Roma with no release clause, that would be a major indication that he doesn’t plan on going anywhere.